Why don't we have killer French heels, the likes of which were *the* heel style for hundreds of years, on shoes these days? Where did they go? Are they just out of fashion, or is there another reason? Since I've been designing shoes for the American Duchess historical footwear line, I've run into all kinds of interesting problems with the manufacturers who make the various parts of our shoes. One of the more difficult aspects has been the heels. I insist upon period accurate heels, but the problem is that nobody makes them, so all the heels we use on our shoes are custom made. It's expensive and time consuming, but also so frustrating - why don't any factories just already make them? At first I thought it was because they were just out of style, but when looking back into ladies' shoe history, a true French, or Louis, heel hasn't been around for decades. Feeble attempts were made at them in the 1980s and 90s, but the examples from that period aren't quite right. They lack the sumptuous curves and sturdy yet feminine balance of a Victorian or Georgian heel. 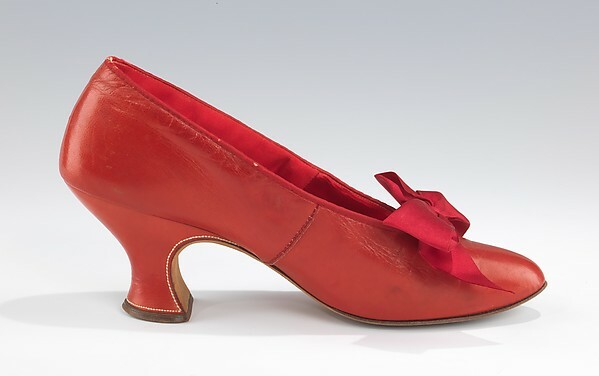 According to Nancy Rexford, in her book Women's Shoes in America, 1795-1930, "the curved [French] heel went out of fashion about 1923, and from 1924 nearly all heels had relatively straight sides..." (pg 84) . We gained straighter Cuban and Spanish heels, still lovely and balanced, but nothing like the curvaceous Frenchies. During the 1920s, the French heel and Cuban and Spanish heels existed together, but by the 1930s, the French heel disappears. Later we get wedges and platform heels, then stiletto and spike heels, and all kinds of weird stuff in the 1970s, 80s, and 90s...but still no return to French heels. 1927, The Met - definitely a Spanish heel. Why? Well...my theory is that it comes down to three things: machines, plastics, and money. French heels by their very design are a hand-turned item. 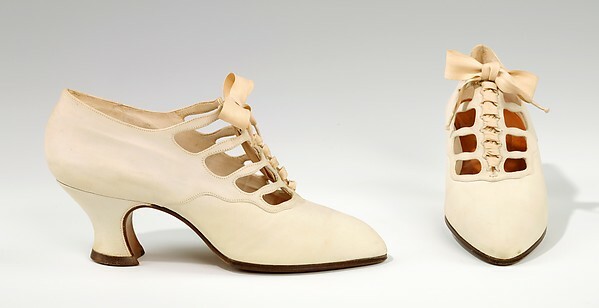 Even in the mid-19th century, with the shoe industry becoming more and more mechanized, heels were still carved out of wood and covered with material by hand. Though the injection molding machine had been around since 1872, it took the advent of World War II to rapidly grow the use of this technology, to answer the demand for affordable, mass-produced products. 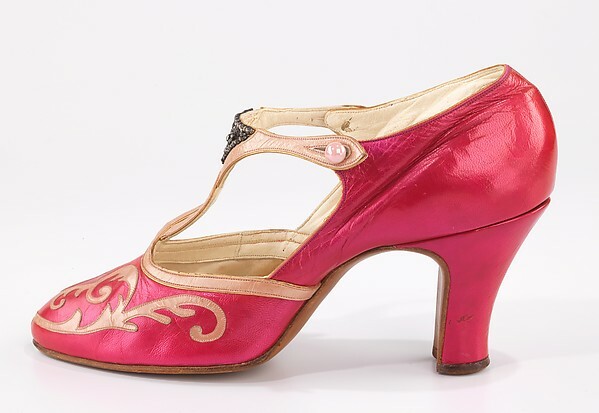 This included shoe heels (an obvious example being the craze for lucite heels - let's not hide our love of plastics or anything), and for at least two decades, wood and man-made heels coexisted, one as common as the other. By the early 1950s, Roger Vivier's invention of the steel-shanked stiletto heel obliterated the use of wood in fashionable sky-high spiked heels, and took the high heel industry forward into a world of injection molded, mass-produced, steel-and-plastic footwear. Today the process is the same - almost all modern shoe heels are machine mass produced, be it with cast plastic, or composite "wood" material (which is not to say that solid wood heels aren't around, but rarely hand-carved, as in the past). 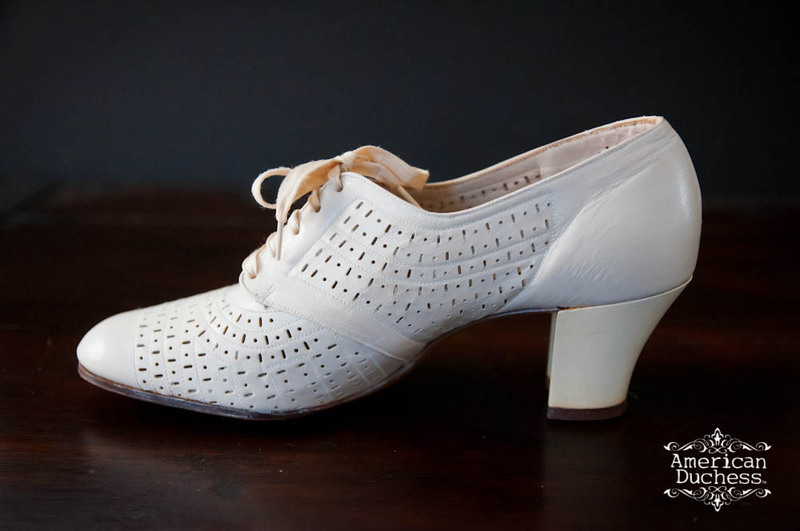 For plastics and composites, molds are made of steel or silicone, and it takes about 7 molds to provide the same heel to one style of women's shoes in 13 sizes (like American Duchess shoes). This means that in order to keep the shoes affordable, a complete heel needs to pop out of the mold, rather than pieces of a heel that then need to be adhered together, costing more molds, time, labor, and specialized skill. So gone are the sweeping curves of the classic French heel, with its waist, its flare, its inward swoop under the arch, all because it is too expensive to cast them in plastic. This is not just a "made in China" thing - it's the product of modern technology, materials, and consumer culture. 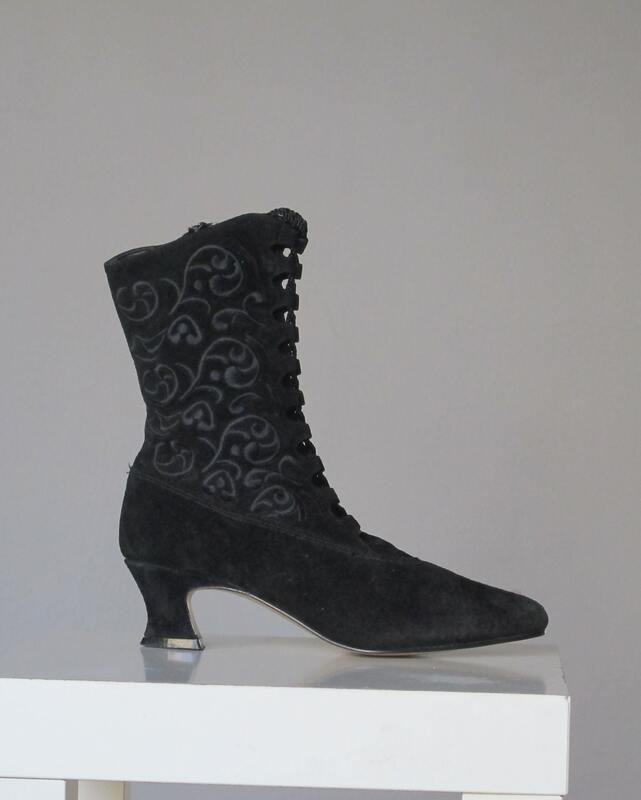 An iteration of Pompadour's heel, during development. 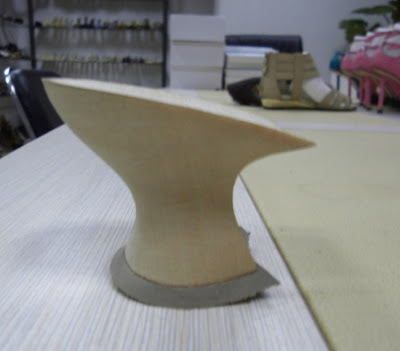 The prototype heels are still carved in wood, by a skilled craftsman, but will later be molded and cast in plastic, before being covered in leather. How do I know this? I had the "joy" of encountering these issues with Pompadour's super-swoopy French heels, which ended up to be a headache and a half when it came to manufacturing them. Now you know - Pompadour's heels are not just cool, they're the only modern heel on the face of this planet that are shaped like that, through much blood, sweat, and tears. Next time you're at the shoe store, I challenge you to find a shoe with a proper French heel! It's a sad loss, but we can only hope that technology and fashion in the future will again bring us back to the most enduring heel style of all time. It surely deserves to be the French heel and not the Stiletto! Interesting stuff; I think I have a Spanish heel on my favourite thrifted pair of shoes. I did not know there were these distinctions! As a theatrical costumer, this is a problem I've been up against for 25 years. I used to buy my heels from Sharlot Battin at Montana Leatherworks, but she stopped selling them because she couldn't find anyone to carve them for her and needed to keep her stock to accomodate shoe needs for all of the productions of "The Phantom of the Opera." I did hear some talking heads in the fashion industry say that we should look for a resurgence of French heels in fashion within the next few seasons. I hope so, for while they may not be perfect to the original shape, it will offer a cheaper alternative for providing appropriate looking footwear for the entire female chorus of a production of "Hello Dolly!" I suppose it's an issue of 'undercuts' in terms of how many mold pieces are needed for the heel. I can see where it would be more challenging to make a mold for a true French heel than a straight heel. I'd never thought of that as to why they aren't around but it makes perfect sense. Thank you for bringing back this classic style, and I hope before long I can afford a pair! It's definitely "undercuts," for sure. To share a little business secret, with Pompadour's heels, the factory developed the heel in wood, we paid the mold fees, and only then did they realize it couldn't be done in one mold. I insisted we not be dinged for their inexperience and mistake, so they produced the heels at their cost, which is why the price of Pompadours is affordable and not stupidly expensive. My goal is to keep them that way! PS. Loved your Gala night costume...saw the Nevada ladies parade in and it was definitely impressive. I make a go of it. The dream is to reproduce absolutely perfect French heels, but not have them break the bank (mine and anyone who wishes to buy them, lol). A couple of years ago, when I first started working at the museum, I had to register the entire collection of shoes. This is when I found out what a French Heel was. 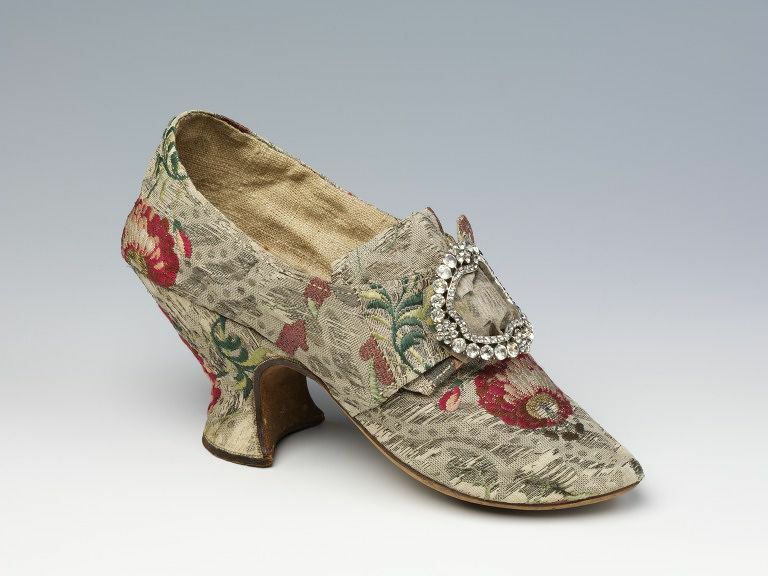 I was absolutely enthralled by the beautiful heels, especially when they were attached to a beautiful silk shoe of the mid to late 1800s! They are so feminine and make the shoe look so elegant. Original French heels really are works of art, I agree! The balance and design, especially, so perfect. I think you are one to something... I too wish for a speedy return! KittyKatt, I've ordered a pair of Pompadour shoes, and I suffer from wide feet as well. I'll let you know how it goes. I bow to your wow, wonderful article! It is so hard to find good information on heels, toes and the basics of shoeness. This is a fabulous piece and I thank you very much. I started out hunting up Spanish heels and came away with French and Cuban to boot! PS I also envy you your trade, but I did enjoy basking in the reflected glow. Thank you for making these lovely shoes! When people still walked everywhere, it was extra-important that women have stable and balanced shoes, even when dressed up. So now French heels have gone away, along with city streets designed for pedestrian traffic. I love the broad heels, especially for an outdoor wedding or party. Very interesting! I recently found the brand Neosens, from Spain, who actually do something which approximates a french heel (they have a style line named Roccoco http://www.neosens.com/en/women#/family-rococo ). Can't find them in the stores here, although they are available online. Meanwhile, I'm still wishing shipping and import taxes would't be what they are between the US and the EU, because otherwise I'd definitely own a couple of your styles ;). I was jut wondering if shapeways (3D printing) would make them affordable? Hello, loved your article and had the same question, why and where have they gone. They made a resurgence in the late 50's early sixties and were called 'squash' heels. I loved them and hand many pairs. I want more. I'd buy them now if I could find them! I thought at least a Roger Vivier might listen to us! I adore french heels and had a couple of pairs in the 50s/60s. They were probably a variation, not so thick but still with that curve accentuating the curve of the leg, and were sometimes called kitten heels. I've hoped for a comeback of this style ever since. It's interesting to know the reason why, thanks.